Successful products begin with specific users in mind. Getting to know your audience—then designing for them, and even with them—is critical to building something valuable. Google’s Design Sprint Kit offers a way to connect more deeply with potential users, while making problem-solving for the right issues a key part of the creative process. The flexible six-phase framework—Understand, Define, Sketch, Decide, Prototype, and Validate—allows for direct collaboration and testing in a matter of days. Successful sprints generate enthusiasm and thoughtful forward momentum. 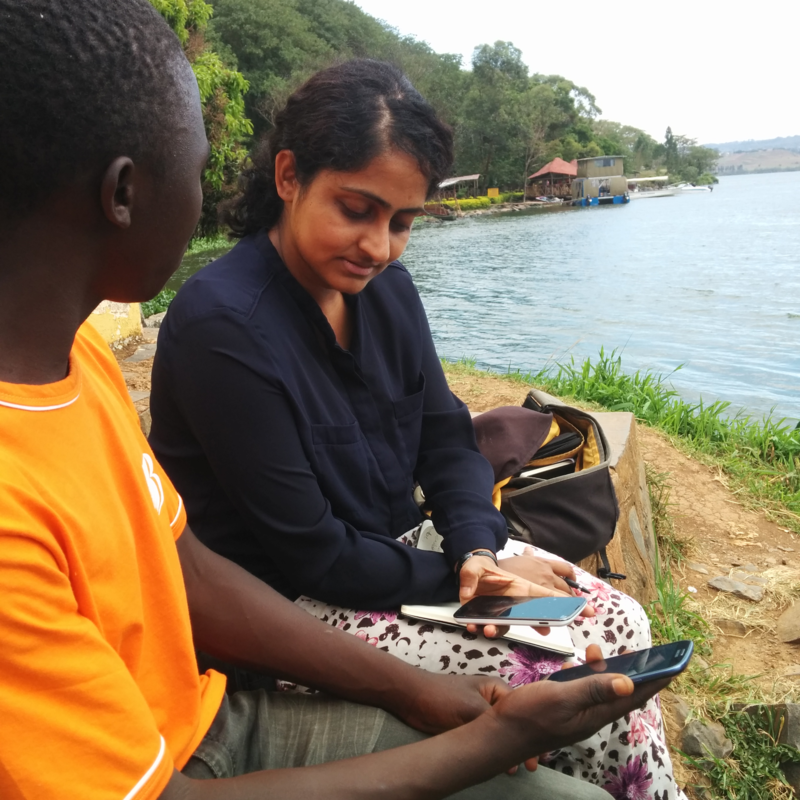 Listening to local voices is a key part of doing a Design Sprint; developing a deep knowledge of potential users and their daily lives is essential, but logistics can be a challenge. So, what are the most effective ways to get face-time with an international audience who may live on the other side of the world? In this article, we’ll share how Google designers Sumier Phalake, Burgan Shealy, and Koji Pereira bridge geographical gaps by incorporating user-driven techniques to plan their sprints. 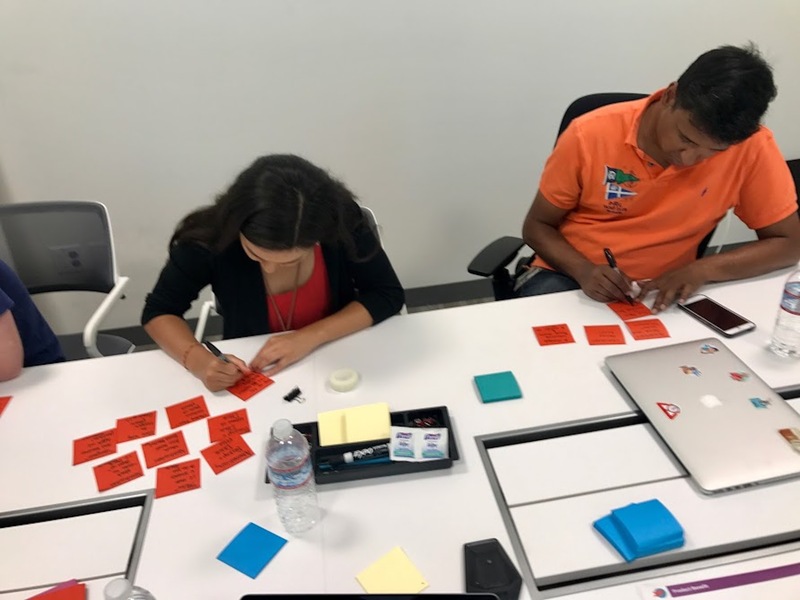 Design sprints often rely on lightning talks—fifteen minute presentations by sprint attendees on user research, business goals, and other relevant topics—to develop a shared understanding of user and product needs. They’re generally sufficient when designing for familiar contexts, but likely won’t convey enough nuance when designing for unfamiliar users and locations. To establish the deep, local knowledge required for confident design decisions, we recommend that sprint participants travel to conduct location-specific foundational research before the sprint. Focus on building awareness of potential users by observing them in everyday activities and bringing these insights to the sprint. Empathize with potential users by looking at life from their perspective. Be patient as foundational research will take more work up front, but this step is crucial to establish the confidence and design intuition needed to drive a sprint forward. Sketching solutions collaboratively with end-users can help generate innovative ideas. When designing long-distance, we recommend involving people who are local experts from the beginning of the sprint. Co-designing is a particularly effective method of collaboration, because it puts those most affected by the solution at the heart of the development process. Google Maps’ two wheeler mode is a great case study in co-designing. The team collaborated with drivers for Go-Jek, an Indonesian company that offers rides and delivery services via motorbike. Because these drivers spend a majority of their day on two-wheels in Jakarta, they offered a singular understanding of the problem space, and shared their daily needs and timelines, pain points, and how they navigate through the city. When sketching solutions, Go-Jek drivers were able to draw on first-hand experience to contribute novel ideas. Co-designing offers numerous benefits, including increased knowledge and empathy with potential users, more confident decision making, and immediate validation of concepts. Overall, when product teams and users create something together, both parties are more invested in the outcome. Sprint participants discuss the ideas generated from a sketching exercise. 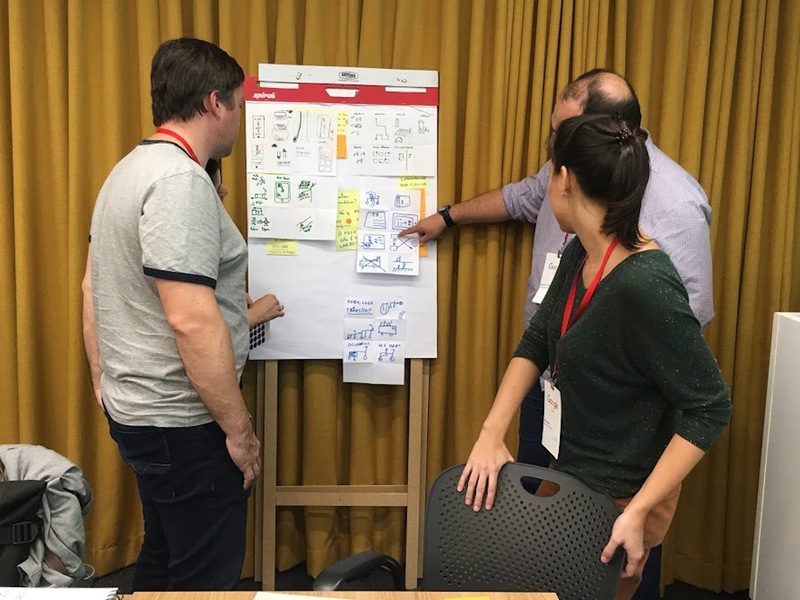 Prepare local experts in advance by letting them know what to expect in the design sprint, and let them review activities that they’ll participate in. Consider a translator for local experts who might be more comfortable speaking their native language. Facilitate inclusivity by considering a variety of participatory activities for local experts, including drawing, storytelling, or role playing. Identify diverse users and invite a range of experts to co-design during the sprint. Select a comfortable, convenient location that will put people at ease (think co-working space rather than formal office setting). Once a prototype is built, it’s time to test it with potential users; the goal is to access unbiased feedback. Labs or offices may feel intimidating to participants, so we recommend conducting intercepts—short, 15 to 30 minute interviews—with people in everyday places like parks and cafes. These environments typically put them at ease, resulting in more authentic feedback. Intercepts also allow for non-researchers like product managers or engineers to conduct interviews, enabling first-hand observations of the prototype. We’ve generally found that people are eager to answer questions and discuss their experiences, but there are techniques that facilitate a smooth conversation. In order to break the ice and politely get close to people, introduce yourself and explain you’re running a quick research study. Then ask for the interviewee’s name and 15 minutes of their time. And don’t forget to smile. Intercepts—brief interviews with potential users in their everyday settings—enable quick feedback to validate or invalidate prototypes during Design Sprints. Limit intercept groups to three people—a moderator, translator and notetaker—because a big group of people approaching an individual may feel overwhelming. Get a good interpreter to capture local expressions and tone, which will help assess a prototype’s effectiveness. Be aware of cultural nuances like the accepted way of addressing people and dressing. Record with permission and be sure to approve consent before requesting video, which is a powerful way to communicate findings to your team. Account for selection bias by diversifying your participant pool; vary the age, gender, and income level of those you’re interviewing. Carefully consider whether you want to reveal who you work for in advance because this information can impact interviewees’ responses. After conducting intercepts, debrief with your fellow sprinters to review key themes and takeaways, then prioritize solutions by voting on the most effective prototypes. After a sprint, your teammates will probably feel even more excited about your product’s next development phase—or preparing for launch—but it’s important to keep learning about your users. Developing this deep understanding of new countries, cultures, and worldviews takes time. We recommend continuing to invest resources into research and immersion trips to help give your team the understanding they need to build the best products.